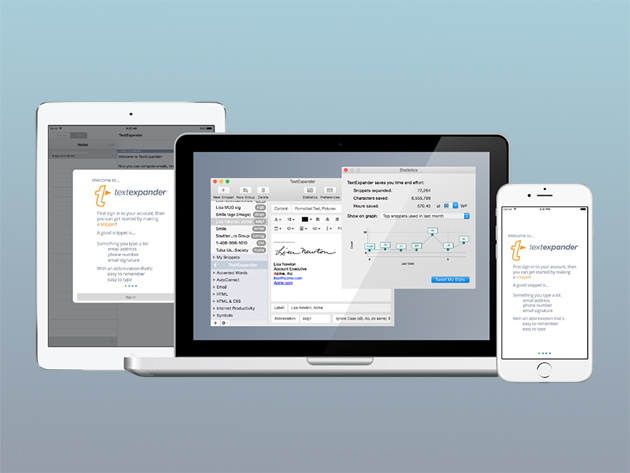 The harsh reality is you waste time typing the same thing over and over, whether you notice it or not— but that’s where TextExpander comes in. This highly popular app allows you to create custom shortcuts that populate any set of text or images you want to save you the time and effort of typing. Whether it’s HTMLformatting, a salutation, or even a lengthy email, you’ll find minutes and hours freed up. Your powerful collection of snippets is now available everywhere; wherever you are, on any device, and instantly shareable with friends. To purchase a team user license (great for companies! ), see drop-down above.